Plenty of posts have been written about all the new features, but I want to point out a few that I think are ripe for marketers. The biggest change from a design standpoint is the addition of what Facebook is calling the Cover Image. This 851 x 315 pixel image dominates the head of the page and while this tip isn’t much of a trick as a reality – use this space! Because the image so dominates the design of the page make sure you send a very strong visual image with this real estate. There are some rules that Facebook is going to enforce, such as no calls to action and no references to “Like” or other Facebook terms. You will also have the ability to tuck a profile kind of square image (180 x 180) into the cover. The sizes and position of these images are fixed but you can get pretty creative with this space. The main bit of advice is to get an image that says a lot about what your brand is all about. Down below the Cover Image is the About tab. This box links to the traditional about page that has always existed. However, you now have the ability to dictate what show up on your Facebook homepage in this box. If you’re set up as a local business in your Facebook About settings then the default for the About box is your address and phone. This may be fine, but if you would rather have a tagline and link to your website, then edit your About settings. Keep the text short, about 90 characters including web address, so that it doesn’t fall off the page. 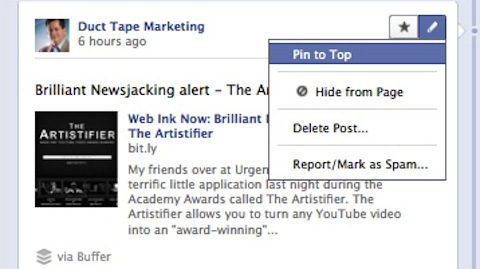 Another way to bring focus to something you are marketing is to pin a story or item to the top of the page. As the admin you can pin a story for up to 7 days and will appear as your top story. To pin an item you simply click on the edit button to the top right of a story and hit Pin to Top. 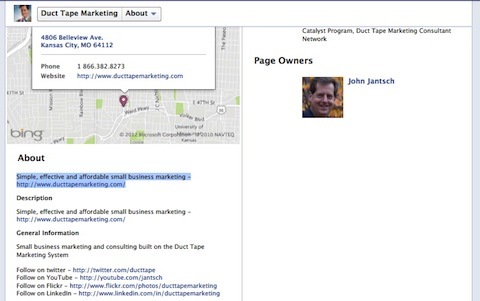 Facebook lines the posts and updates on your page up in two columns. If you want to bring special emphasis to an important post or highlight a product launch you can hit the star in the upper right corner of the update to highlight it. This makes the post spread across the page and brings special emphasis to it. Take the time to update these little features today. I’ve seen a traffic spike from Facebook due to some of these more marketing friendly little tweaks. In the end though it’s still about the content. Make sure you continue to invest in the wall and creating visually and mentally stimulating content.